From the Korean Overwatch Fan Festival, Jeff Kaplan gave an announcement that we’d be getting a new map, set in a futuristic version of the Korean city of Busan. In addition to showcasing the map itself, he also announced that it was going live on the PTR today. He was true to his word. Before the short Shooting Star finished airing, the map was on the PTR. 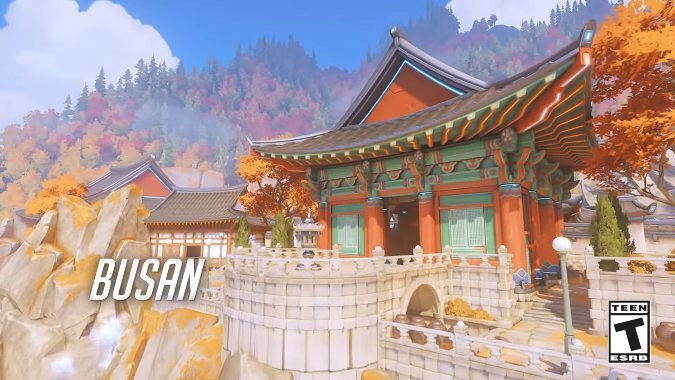 Busan is a Control map, joining Ilios, Oasis, Nepal, and Lijiang Tower in the rotation. In the highlight reel for Busan, we see a few areas of interest to both fan and tourist. There’s D.Va’s room and the MEKA hangar to explore, but there are also maglev trains in the bustling city, a traditional Korean temple, and a karaoke lounge. As with all of the maps in Overwatch to date, there are fun easter eggs all over. One of the players from the L. A. Gladiator’s Academy team Legion found a functional Dance Dance Revolution machine, for example. There was a reel to discuss the map’s design decisions further. Apparently the sound design team wanted to really capture the feel of Busan itself, so they hit the streets to record ambient sounds. The whole team wanted to honor the feel of this actual city, while also making it appropriate to appear in Overwatch. As a fun treat, at the Korean Overwatch Fan Festival, there’s a model of the Busan map made entirely out of LEGO. This ties in nicely to the announcement yesterday that they’re making some heroes from Overwatch into minifigs, but I’d assume this doesn’t mean we’ll get to purchase the full map. Maybe a small playset or two later on. Are you excited for the new map?